MMS JULY 2018 68 mmsonline.com CUTTING TOOLS Engineering still gets questions about how best to leverage this technology. 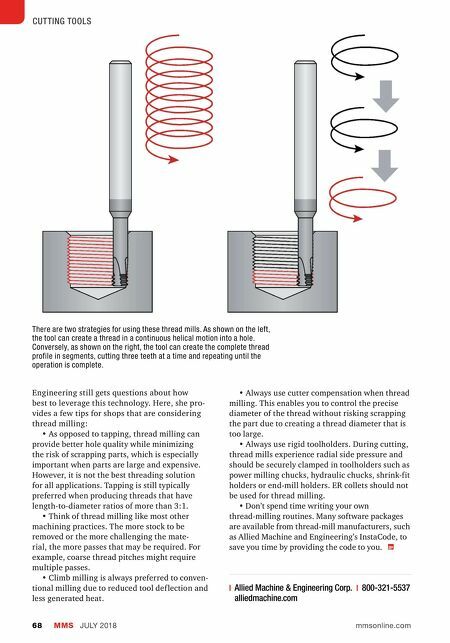 Here, she pro- vides a few tips for shops that are considering thread milling: • As opposed to tapping, thread milling can provide better hole quality while minimizing the risk of scrapping parts, which is especially important when parts are large and expensive. However, it is not the best threading solution for all applications. Tapping is still typically preferred when producing threads that have length-to-diameter ratios of more than 3:1. 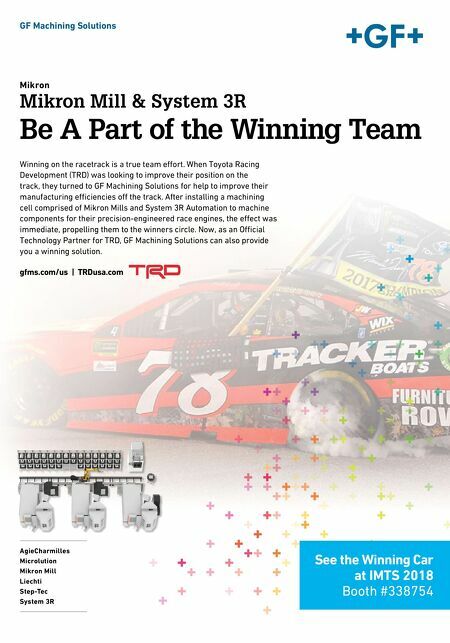 • Think of thread milling like most other machining practices. The more stock to be removed or the more challenging the mate- rial, the more passes that may be required. For example, coarse thread pitches might require multiple passes. • Climb milling is always preferred to conven- tional milling due to reduced tool def lection and less generated heat. • Always use cutter compensation when thread milling. This enables you to control the precise diameter of the thread without risking scrapping the part due to creating a thread diameter that is too large. • Always use rigid toolholders. During cutting, thread mills experience radial side pressure and should be securely clamped in toolholders such as power milling chucks, hydraulic chucks, shrink-fit holders or end-mill holders. ER collets should not be used for thread milling. • Don't spend time writing your own thread-milling routines. Many software packages are available from thread-mill manufacturers, such as Allied Machine and Engineering's InstaCode, to save you time by providing the code to you. | Allied Machine & Engineering Corp. | 800-321-5537 alliedmachine.com There are two strategies for using these thread mills. As shown on the left, the tool can create a thread in a continuous helical motion into a hole. Conversely, as shown on the right, the tool can create the complete thread profile in segments, cutting three teeth at a time and repeating until the operation is complete.